This is part 3 of a historical timeline of noteworthy events in Big Bear’s history. It was started by my very good friend and local historian Tom Core, who passed away in 2006. The Timeline is continually updated, with new entries as additional information becomes available. Blizzard conditions again swept the mountains for two years in a row. Two Shay stages hooked together left Big Bear, and took 8 hours to reach Victorville. A cage with 28 sleeping road camp prisoners washed into the Santa Ana River. Guards released them, but eleven vanished in the storm. The Santa Ana River road was completely washed away, and the Edison Company used a hundred men to open the powerhouse road. The Clark Grade was closed with a big slide. The Mountain Auto Line was able to get through to Bear Valley on the Crest Road after May 13. The Pine Knot Post Office at Big Bear Lake was opened in October in the Pine Knot store, office, and studio building. The Shay brothers shut down their stage line operation. Bear Valley roads were closed so much by the weather that it was unprofitable to operate. Shay and Barker purchased 320 acres from the Talmadge IS Ranch and added more cattle to their herd. The Mountain Auto Line fleet now had 15 White trucks and stages, and 22 men on the payroll. Bear Valley Development Company began subdividing around Big Bear lake anticipating the inevitable future growth of this resort area. White Stages were rugged and powerful enough to handle the steep dirt roads through the San Bernardino Mountains. 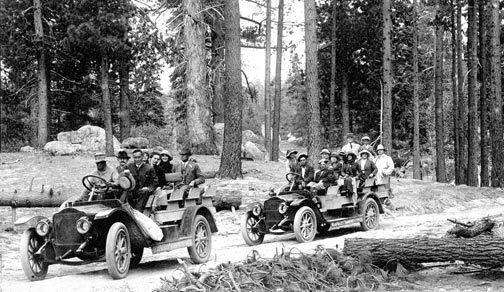 For many years they provided the first regular motorized transportation into Big Bear Valley. – Rick Keppler collection. During the winter, Pine Knot Lodge cooperating with auto dealers offered a cup to the first car into Bear Valley after March 1. Twenty five cars were in the race, and it took twenty five days for the winner to finish! They had been hopelessly stuck in deep snow. Gus Knight purchased all the Oxnam Estate lands around Baldwin Lake and built a clubhouse and blinds for duck hunters on the north shore. The Bartlett Brothers built a store, service station, and café in the heart of Pine Knot at the intersection of today’s Bartlett and Village Drive. B. G. Holmes bought the six Blair log cabins on the south side of the village in Pine Knot, and changed the name to Indian Lodge. Margaret Betterley established Camp Eureka east of the Pine Knot village, on land purchased from Gus Knight. William Cline and Clinton Miller bought 700 acres at Grout Creek, and began subdividing. First called Grout, the name was soon changed to Fawnskin. They built a large hotel and commercial building called the Fawn Lodge that still exists. A post office was opened there in May of 1918. Cline and Miller’s new subdivision at Grout Bay on Big Bear Lake’s north shore. Today it is the community of Fawnskin. – Rick Keppler collection. Albert Brush began construction in July of the $100,000 concrete Big Bear Tavern near the IS Ranch headquarters just west of the village. It still exists today as the Presbyterian Conference Grounds. Operation of the Rim of the World Highway through the San Bernardino Mountains is taken over by the California State Highway Department. Gold Mountain Mine at Baldwin Lake was reopened by James G. Hulme. He repaired the buildings and machinery and began crushing 100 tons of ore per day running around the clock. Fish and Game built a second fish hatchery in Big Bear Valley at the Green Spot about three miles south of Baldwin Lake. Waldo Waterman lands a World War 1 Thomas Scout fighter aircraft in a meadow on the old Shay Ranch in an area that would later become Big Bear City. He is the first person to ever fly an airplane into and out of Big Bear. In Big Bear, Carl and Mamie Stillwell built a camp and a boat landing on two acres north-east of Pine Knot. The famous Stillwell Ballroom was built the next year. Bear Valley’s first school opened in September at Lowe’s Camp in a log cabin donated by John and Mayme Lowe. Their three children were half the enrollment taught by Miss Vera McPherson. The Big Bear Chamber of Commerce was formed. The community was growing, there were now 600 cabins in the valley. For the first time about 100 people remained through the winter in Big Bear Valley. 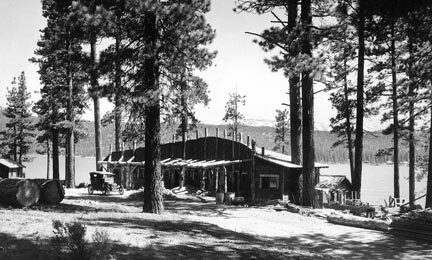 Moon Camp on the north shore of Big Bear Lake was under construction by N. B. Burkey of Pinecrest. Moon Camp got it’s name because of the unusual crescent shape of it’s main Pavilion. The building was built to fit a curve in the highway on the north shore of Big Bear Lake. – Rick Keppler collection. The “Theatre Under the Stars” at Fawnskin became the setting for several exceptional theatrical presentations each summer season. The Motor Transit Company of Los Angeles bought the Mountain Auto Line, but Max Green remained as manager. The new $20,000 Grizzly Theatre opened in Pine Knot, but patrons had to bring their own chairs as the seats had been delayed in shipment. The north shore road at Big Bear Lake was now open from Fawnskin to Gray’s Landing. It would be another four years before the north shore road would reach the dam. The Forest Service had a dozen surveyors working for five months laying out the route of the proposed Deep Creek Cut-off to Big Bear. Charles Tayles and W. L. Rideout bought property from the Estate of Judge J. G. North, and started the North Bay Camp and Boat Landing. North Bay on the south shore proved confusing, so Tayles had the name changed to Boulder Bay. Another cold hard winter with all roads into the Big Bear Valley hopelessly closed. Several Big Bear children became ill including Lucy Knickerbocker. Neighbors united and took the children down the desert road wrapped in blankets on sleds. After a battle of two days, the waiting autos were reached. Sadly, it was too long for little Lucy who died from a ruptured appendix. The Gold Mountain Mine received electric power from Victorville over a 24 mile $35,000 power transmission line. An electric motor would replace the big Corliss steam engine, and cut operating costs. The Motor Transit Company had 24 new trucks and buses to start the season. Big Bear was having a building boom. Eighty new homes were added this year, new businesses were opened in Pine Knot, and there were now twenty four resorts or camps around the lake. E.C. 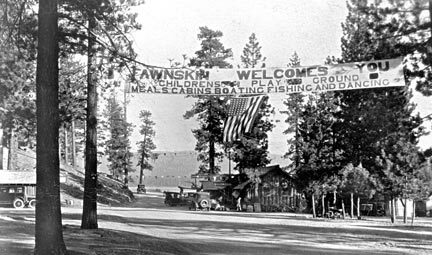 Jesserun obtained 40 acres west of Baldwin Lake that would be developed into the popular Pan Hot Springs Inn. Indoor and outdoor swimming pools were heated by a natural underground hot spring..
Utah Construction Company steam shovels began digging the shelf road above Bear Creek that would be called “The Arctic Circle” on the Deep Creek Cut-Off to Big Bear Lake. After 14 months of work the $283,000 Deep Creek cut-off was completed on October 6. The new road was now open from Gray’s Landing in Big Bear to Fredalba (Running Springs). Robert T. Moore started the first fox farm in Big Bear Valley. Called the Borestone Ranch, it was located on 48 acres east of Pine Knot village. An unprecedented 40,000 people swarmed to the mountains over Labor Day, hundreds forced to sleep on the ground or in their cars. The Talmadge brothers IS Ranch bought 1,130 acres of Big Bear Valley pasture land from the Shay and Barker Ranch. Big Bear Boulevard was oiled through Pine Knot to reduce the intolerable dust problem. The Motor Transit Company opened a new $25,000 freight and passenger depot on Pine Knot Avenue. Waldo Waterman takes off from with four passengers in the first commercial flight out of Big Bear. On the return flight, the aircraft was forced to make a crash landing on a dry lake bed in Lucerne. No one was hurt, but the stranded passengers were forced to find alternate transportation back to Big Bear. Coy and Lex Brown’s Poligue Canyon sawmill produced one million feet of lumber to meet local demand in Big Bear. 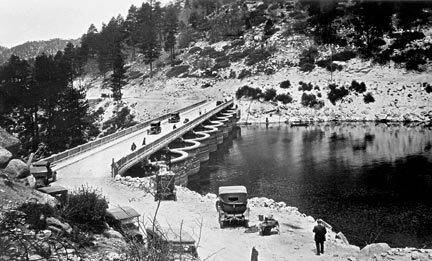 A concrete bridge was built across the Big Bear dam by 60 men at a cost of $30,000 to connect the new south shore road to the village with the Rim Of The World highway. Better roads, automobiles, and bus service had increased the number of resorts in the San Bernardino mountains to over 200. Harry Kiener forms a corporation to develop the ranch lands at the east end of Big Bear Valley. They started their development by building the fabulous Peter Pan Woodland Club. This was the beginning of Big Bear City. Fawnskin residents built a two room schoolhouse for their dozen or so children. During the entire winter, the Deep Creek Cut-Off highway to Big Bear was open only one week due to heavy and repeated snowfalls. In July, the state added $676,000 to further improve the high gear Rim of the World Highway. The State Department of Highways Maintenance Station at Fawnskin received and assembled their first Snow King Rotary Plow. Walter Krukman, General Traffic Agent for the Motor Transit Company, staged a Winter Sports Carnival at Big Bear. This was designed to help business for the bus company in the winter. 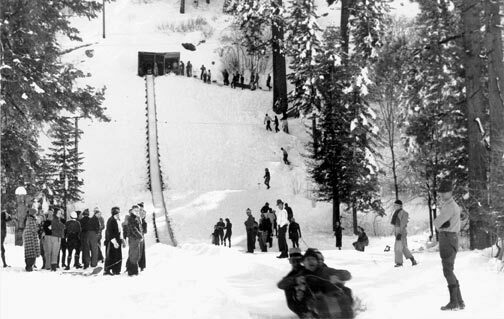 A competition ski jump was also built in the hills just west of Big Bear Village near Paine Road, where the Elk’s Lodge is today. It was supported by the Viking Ski Club of Los Angeles which provided ski instruction and sponsored regular competitive events. 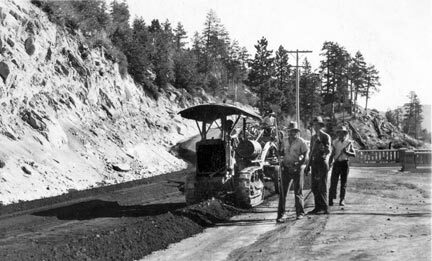 The first black-top paving experiment in the mountains was completed between the Big Bear Dam and Running Springs. The airport at Big Bear City was smoothed for use of new Ambassador Airways. The Talmadge IS Ranch bought the remaining 700 head of Shay and Barker cattle and 40 acres of grazing land in the desert. The Bartlett brothers begin construction of a dam for a new lake on 218 acres just west of the village that they had purchased from the IS Ranch. It was located in the hills above the south shore of Big Bear Lake. It was their intent to build the largest resort in Big Bear Valley. The Bartlett resort was never finished. The lake they created eventually became known as Cedar Lake. Thanks to the efforts of Clifford R. Lynn, the Big Bear Valley Park, Recreation, and Parkway District is formed. The newly formed Park District raises enough money through taxes to build a toboggan run on “Lynn Hill” behind the village. A sling lift is also built on Lynn Hill. It would drag ten people at a time to the top of the hill, and then return to the bottom for another load of skiers. These new winter facilities were an immediate success. More and more Big Bear Lodges and businesses began staying open all year. An election is held this year, and the community of Pine Knot officially changes it’s name to Big Bear Lake.